iAVR Output 5000 watts for up to 10 sec. The transfer switch isolates the generator, so it can't accidently electrify external power wires. Honda offers a selection of Transfer Switches, including 4, 6, 8, 10 and 12 circuit models. 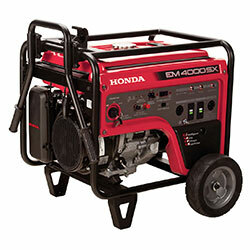 Contact your Honda Power Equipment Dealer for detailed information. This device must be installed by a qualified electrician. For lifting units with cranes for easier transporting and securing units left on job sites overnight. This remote start kit allows for convenient starting of your generator from a remote location.